And it’s a wrap. We just finished the opening scene now it’s a simple matter of condensing two hours of footage into a 5 minute film for the next two days. Oh the joy. So slightly later than planned we first started the principle photography with actors on the 18th as opposed to the 17th, as one of our actors was unavailable at the time. So 18th the shoot went fairly well, we’ve decided to start straight into the middle of the film which proved to be an interesting experience because it required us to shoot an eating scene, as film making is a much slower process than cooking unfortunately. So imagine the rigorous torture for the three very hungry actors who weren’t allowed to eat or about an hour just because all that food had to be set up and used as props for film. 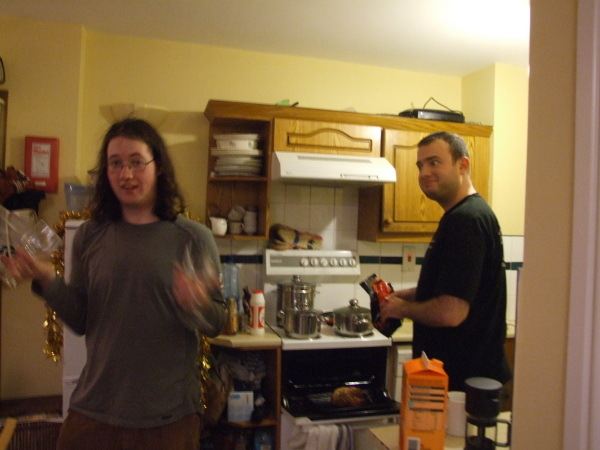 An important lesson was learnt that day, never ever put the catering into film. So the shoot started roughly from seven and finished at one in the morning but we still need to get back and add a few more little scenes. I was glad we got to use the cheap clapper board we bought the week before, not becuase it adds to the production value but it’s highly amusing to watch in editing :). 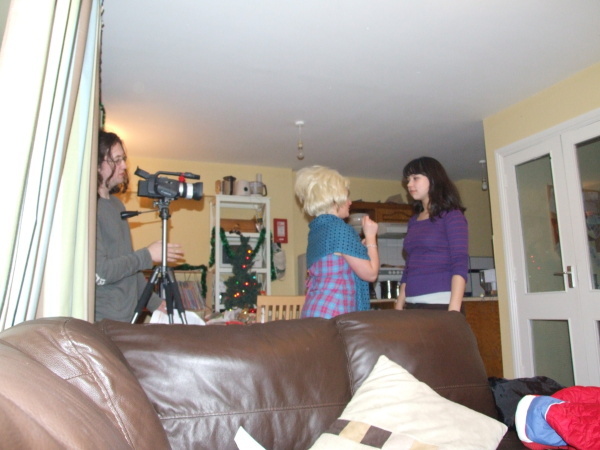 Unfortunately we didn’t have the clapper board for the shoot for the following day. 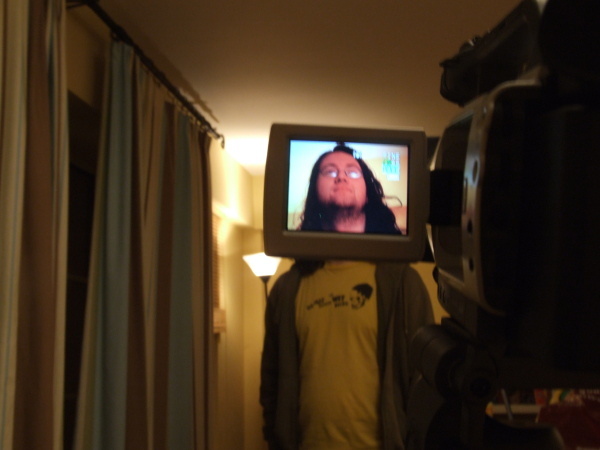 Today’s shoot was the final scene of the film, because Cethan’s house isn’t as brightly lit in some parts there’s quite a bit of grain added to the footage as well as flicker, it’s an unfortunate short coming with the Canon GL2. Thankfully the scene was short enough and two of the actors had to leave early enough so we managed to complete the shoot before they had to leave and we were done earlier than usual. So that leaves the film largely done, we’re aiming to get some of Cethan’s scenes shot in the streets of Cork tomorrow and then wrap up on Sunday ( 21st ) followed by 2 or 3 days of editing though not quite as intense as the other project because I’m pretty sure I don’t have to catch much in editing. We’re well on way to having it done by the 23rd it seems. Bought a neat tripod from the Sony shop in Patrick Street, it’s a Hahnel Triad 50 in case anyone was wondering. I’m no expert with tripods but suggesting from the prices of tripods with similar builds I’ve seen in camera shops, it’s pretty much a steal with a price tag of 60 Euros. It’s a great replacement for the other yoke I used for the past 4 years, which was fine to use with my digital camera but not with a prosumer camcorder which would be the equivalent to horse riding a cat. So expect smooth panning shots in CCC, if there is gonna be any. I have a feeling our shoot will become 17% percent easier with it. I’ve been running around Cork again taking pictures of the city with Tom’s Finepix camera and some of the photos have turned out really well. You’ll be seeing the images in the title sequence and used to depict areas in Cork featuring snow. Speaking of which, I’m working on the snow animation at the moment. There is already a useful method of adding snow to a scene but snowfall is a different matter. I’m coming across a few interesting obstacles that I’m working on at the moment such as object occlusion, hopefully I’ll have it figured out shortly before the principle photography is completed. 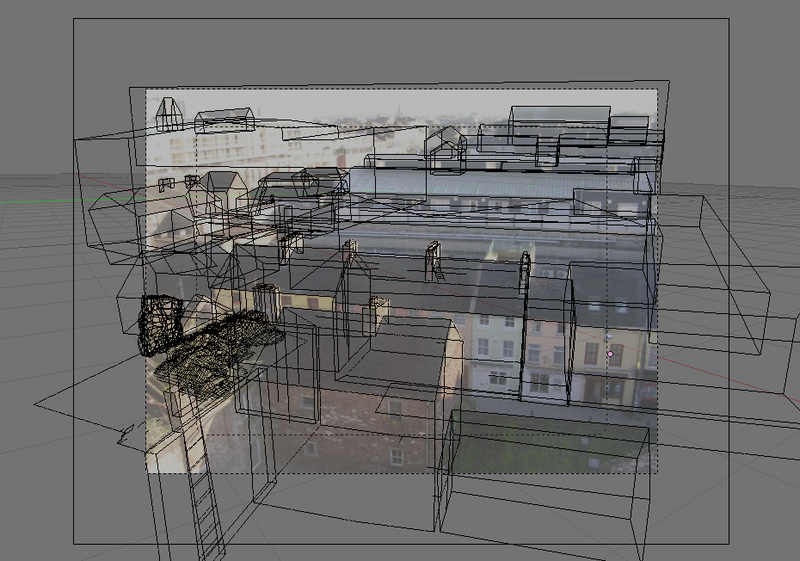 We’re going to cut down on the Special FX due to time constraints, so I’m leaving Camera Mapping out of this, I took a few snaps of Cork City from Shandon tower but it’s far too tedious to map out every object in 3D with these images, though I might look into it again in the not too distant future. Shooting is starting very soon, we’ve already made some changes to the script and because of time constraints we’ve cut some parts of out of the script yet maintaining the crux of the story. The first thing we’re going to shoot is the 2nd scene which starts off with a story transition from the miser to another person whom we follow for the rest of the story. My next post will be about that shoot so check back in 24 hours. Thought I might experiment with Blender’s Camera Mapping technique that I watched from one of the video tutorials made by Peerless Productions. The link to the video tutorial can be found here . The Blender wiki tutorial can be found here. As explained by these lads, Blender doesn’t feature proper Camera Mapping features available on other 3D modelling tools like 3DSMax and Maya, instead you have to use sticky textures to map an image onto 3D objects in a way to match the perspective of the image and the 3D scene or object. Or something like that. 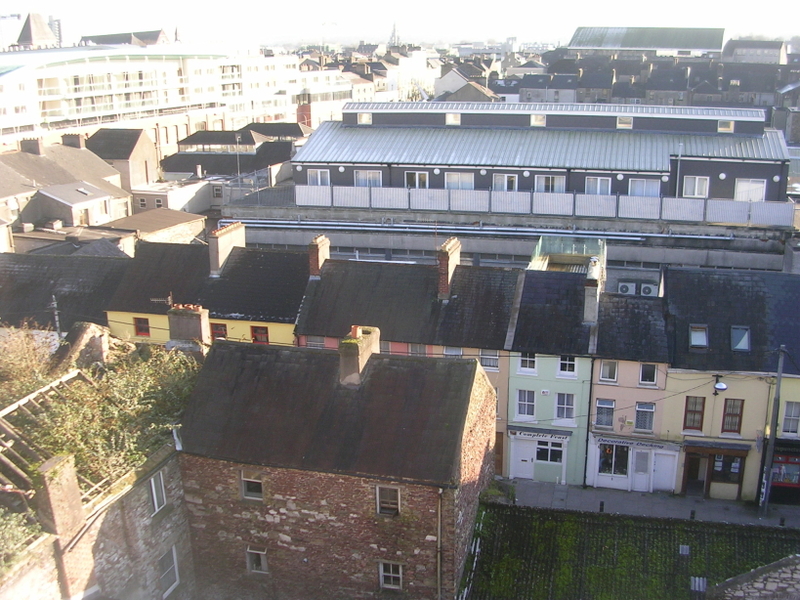 The top image I took from the rooftop of the Car Park in North Main Street. The bottom image is my attempt at re-creating the environment in 3D using the image as a reference in Blender. With a rough 3D representation of the elements inside the image I then mapped the image onto the 3D scene through the 3D Camera perspective. After animating the camera movement and rendering the output, I got this result. Aside from the obvious artefacts, the effect looks pretty good. The process itself can take quite a while but I find the results seem to pay off in the end. 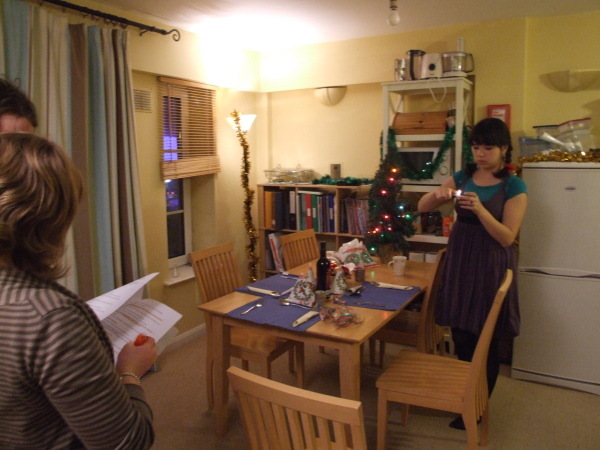 We’re definitely using it as an FX shot in the upcoming Cork Christmas Carol. As previously stated by Patchy, we are going to keep a production diary of the first Gifted Babies Christmas Special, tentatively called Cork Christmas Carol. Patchy will post concept art, storyboads and production photos. I’ll be covering FX stuff, specifically how I give Cork a white Christmas using open source software such as GIMP and Blender, as well as cover other post-production aspects such as audio mixing and video editing. I also intend on writing tutorials so at least if anyone is interested, they’ll be able to reproduce some of the same effects, in fact my first production blog will be a tutorial based on creating simple snow fall animation.